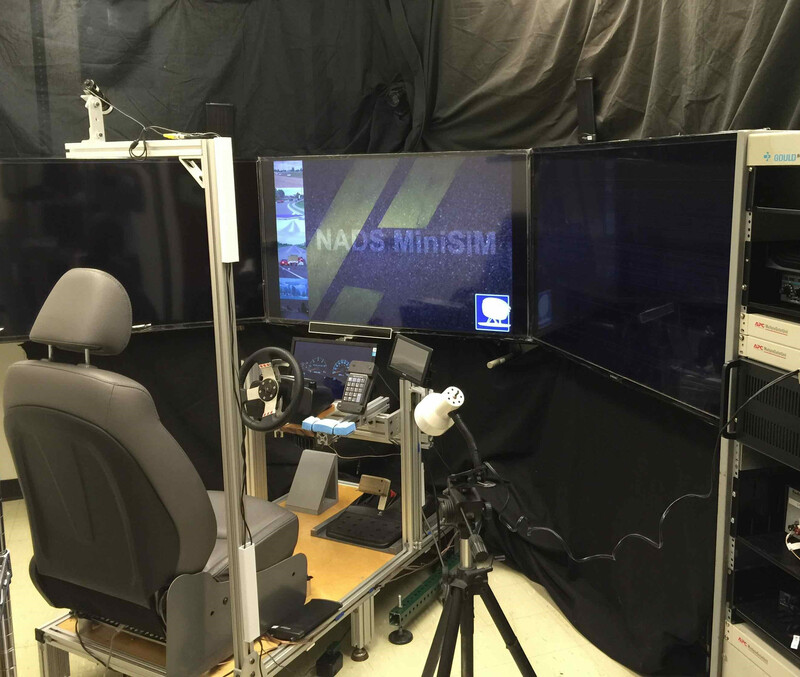 The driving simulator we use for most of our research uses NADS MiniSim software as the framework. The simulator consists of 3 big screen TVs (55-inch diagonal) providing a 120-degree field of view, a car seat with a steering wheel and foot pedals, and computer monitor for the speedometer/tachometer cluster. 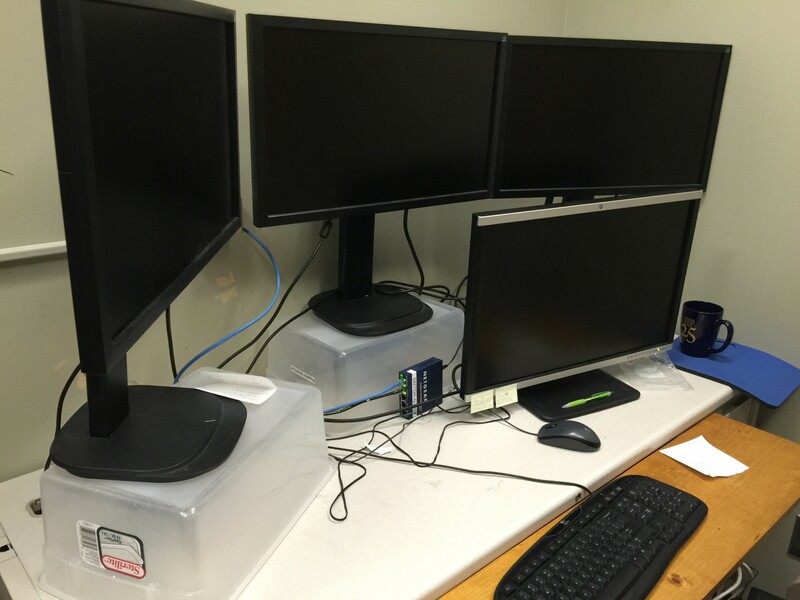 We are working on replacing the fixed-base cab with a moving base cab, developing scenario builders, and using low-cost eye fixation recording systems. We are also making changes to the software to be compatible with the Crank Storyboard instrument panel creation software. Can someone rent the driving simulator to teach my son/daughter how to drive? Most of the driving simulator experiments the Driver Interface Group is asked to conduct or plans to suit a sponsor request take 6-8 months to complete after the project starts. We need some time to create detail plans for the experiment and get approval from the human subjects board, a process that takes a month or so. We cannot conduct experiments they have not approved. Planning involves selecting the dependent and independent measures, what should be the sampling rates, how much time should be allocated for various conditions and practice, which vehicle and pedestrian movements should be simulated, and specifics for vehicle gaps, speeds and acceleration/deceleration rates, lane change time, traffic signal timing, and so forth. Subsequently, programming the simulator begins. Programming is invariably done by the student or researcher conducting the experiment, which means that anyone using the simulator will need to learn how to program it. Almost every experiment we are asked to do is a “one-off,” something that is unique and has not been programmed before. There are no “standard” worlds. We need to build the world, and then write code that describes what each vehicle does at each moment. For example, if one wanted an urban scenario, the spacing between each intersection pair needs to be specified as well as the timing of each traffic signal and the rules that cause each signal to change. This step takes 2-3 months. Next we conduct pilot tests of the experiment and then conduct the actual experiment. Pilot testing is conducted to remove any final problems with the scenarios and make sure the experiment can be conducted in the time allotted. This step takes a month to a month and a half. The final step is reducing and analyzing the data, and then writing a final report. This step takes 2-3 months. Thus, conducting driving simulator experiments is much more time consuming than the lay public expects. A common misconception is that they expect us just to walk into the simulator lab when the project starts and everything is ready to go. 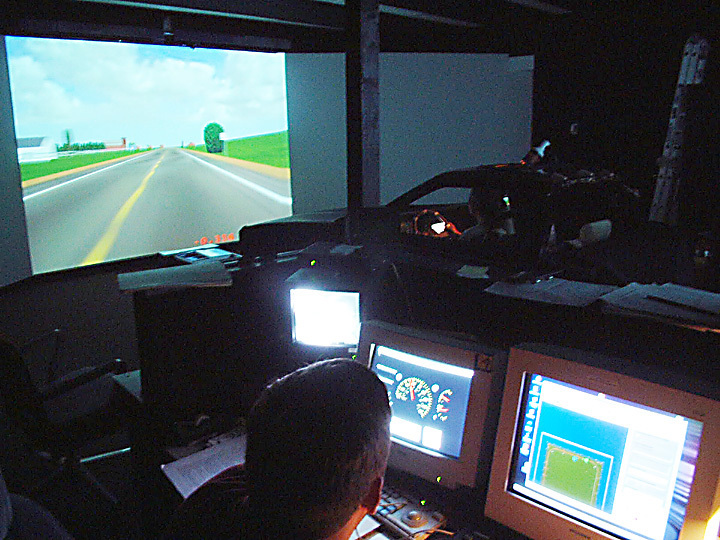 When Are Driving Simulator Tests Favored? In driving research, there is no one best tool. Sometimes one needs a screwdriver and sometimes a hammer. In driving, the options are often to conduct a paper and pencil evaluation, to use a simple mockup, to collect data in a driving simulator, or to collect data on the road. The “road” can refer to a test track or a public road. Often, the selection of a test context is between in a simulator and on the road (in a real vehicle). 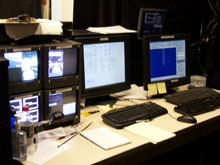 The simulated situation provides complete control of the test situation. The exact same conditions of weather, road surface condition, ambient illumination, vehicle positions, and speeds, etc., can be repeated time and time again, and for every subject. In the real word, even with confederate vehicles, there are some things beyond control, with the weather being one of them. Simulators are also favored where risk to drivers is an issue. People cannot really die in a driving simulation, so they can be exposed to crash provocative situations that a human subjects review board would never accept for an on-the-road study. However, simulations are just that, not the real world, only an approximation, and ultimately, some time before production, concepts need to be assessed in real vehicles on public roads. At UMTRI, both approaches are used, with the choice depending on the maturity of the solution being examined, the time of year, the need to examine daylight vs. nighttime conditions, risk to subjects, and so forth. In very large projects, it is often the case that concepts are first explored in the driving simulator, and then when the alternatives have been narrowed to a small set (and thought to be safe enough for use by test subjects), explored on the road. In theory yes, but practically no. 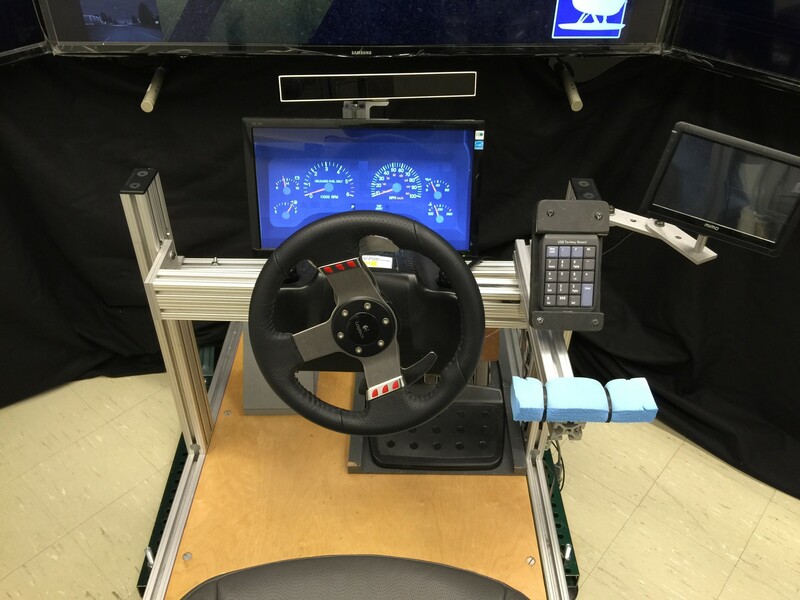 The simulator is a research tool, but could be used to develop an educational program to help teenagers learn how to drive. 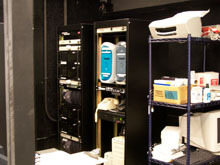 At the present time, UMTRI does not have such a program set up, or set of validated scenarios to use for that purpose. UMTRI is very interested in developing such, but a research project to develop and validate scenarios is far beyond the means of all but the extremely wealthy (hundreds of thousands of dollars). Can Someone Rent the Simulator to do Research or Testing? In theory yes, but practically no. The “how an experiment is carried out” section describes the process of conducting an experiment. Many have the mistaken impression that since they can drive, they know how to conduct a driving study. A parallel claim would be that knowing how to eat should provide the knowledge of how to study eating and eating disorders. Knowing how to do a task and how to study it are quite different. If someone wanted to use the Driver Interface Simulator, they would need scenarios created that were compatible with our version of the MiniSim software and the other modifications that have been or will be made. We need to do that. To run an experiment that involves University facilities and/or University personnel needs to be approved by the University’s human subjects board. We need to prepare those materials. When the experiment is being conducted, we need to be there or nearby to solve hardware and software problems. When analyzing the data, the sponsor will have questions about how our output is collected and formatted. Thus, we need to help with data analysis. Thus, as a practical matter, we become collaborators, so simply renting simulator time does not make sense.